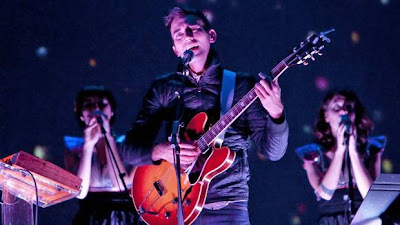 city love: Music: Sufjan Concert! Last night I took part in one of the best musical experiences of my life! Sufjan played Toronto, and I got to go, and we had amazing seats, and he was just SO WONDERFUL! I felt like I was on a cloud all night! He mostly played music from his new album, but we had already been listening to it for a few weeks, so the songs were all familiar, and all TOTALLY AMAZING. He was just so calm, and casual, and he was dancing, and telling us all about where the songs came from. It was really, truly amazing. What a great night: Hanging out with lots of friends, wandering the streets, and just being totally inspired by amazing sounds.